The mainland port city of Brunswick is laid out in a formal grid similar to Savannah&apos;s, with city streets and squares still bearing their colonial names. Docked at the wharf, the array of shrimp boats are ready to trawl the local waters—evidence of the area’s rich seafood industry. Watch the ocean vessels come into port, see the shrimpers unload at the docks along Bay Street and then sample the catch of the day at one of the fine restaurants. 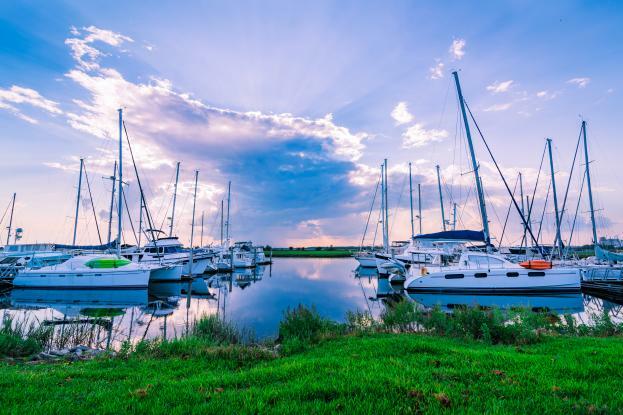 Traveling to Brunswick is easy, with commercial air service available to and from Brunswick Golden Isles Airport (Golden Isles is approximately one hour from the airports in Jacksonville, FL and Savannah, GA). Check out lodging and accommodations in Brunswick and our specials and packages to plan your next getaway to this historic port city. Historic Downtown Brunswick, also known as the Old Town Brunswick, is enjoying a renaissance, with the ongoing renovation and restoration of historic buildings and public squares. Old Town Brunswick is centered at the intersection of Newcastle and Gloucester Streets, the traditional commercial corridors of the city. Newcastle Street is anchored on the south end by Old City Hall (1888) with its distinctive clock tower. At the north end of Newcastle Street is the Historic Ritz Theatre. Built in 1898 as the Grand Opera House, the Ritz Theatre is Brunswick’s center for quality exhibits and performances by local, regional, national and international artists. The historic restoration of the Ritz Theatre is still underway with the most recent addition of the restored, original Ritz sign. Additional restoration is being done by a local preservation group, Signature Squares of Brunswick, who have restored many of the local squares in the downtown. Homes in Old Town reflect a variety of styles dating from 1819, including Queen Anne, Jacobean, Eastlake, Mansard, Gothic and Italianate architecture. The Brunswick Landmarks Foundation works to educate the public and protect and enhance the special historic character and charm of Old Town. Mary Ross Waterfront Park and the adjacent Brunswick Landing Marina play host to a variety of festivals and events throughout the year. Some of the annual events include the Brunswick Rockin’ Stewbilee, the Rhythm on the River concert series, and the Blessing of the Fleet. Find the most up-to-date festival and event listings in Brunswick, Georgia on the Golden Isles events calendar. By day, try your hand at shrimpin’ aboard the Lady Jane, the only shrimp vessel on the entire east coast that has been certified by the USCG to carry 49 passengers offshore, or fish with any of Brunswick’s local charters. By night, catch a show at the historic Ritz Theatre or enjoy a unique dinner cruise experience on the Emerald Princess II casino cruise ship sailing seven days a week from Gisco Point near the entrance of Jekyll Island. With ideal weather conditions throughout the year, Brunswick also supports an active and healthy outdoor life. The beautiful natural scenic landscape invites jogging and walking, from the challenging Sidney Lanier Bridge to the Old Town Brunswick National Historic District and from Mary Ross Waterfront Park to the Howard Coffin Park. Use our map of Brunswick to plan your walking tour of the area, or find a guided historic tour, ghost tour, nature tour and more in Brunswick and the surrounding areas. Families with love the variety of attractions and activities in Brunswick. Kid-friendly activities include a classic arcade, bowling alley and a pottery studio. Discover more with our Guide to Historic Downtown Brunswick on your next trip. There are plenty of great places to stay in Brunswick—from quaint bed and breakfasts to pet-friendly hotels and more. Set the scene for your next visit with comfortable accommodations and easy access to restaurants and shops in the heart of Brunswick. Interstate 95, the main Interstate highway on the east coast of the United States, serves the coast of Georgia. Within Georgia, it begins from the south at the St. Marys River and the Florida state line and continues north past the border of South Carolina at the Savannah River. In Brunswick, the route traverses the south Brunswick River over the Sidney Lanier Bridge and then crosses the Altamaha River Bridge, between Glynn County and McIntosh County. This section of U.S. 17 is known as the "Gateway to historic Brunswick and the Golden Isles" because it provides access to Jekyll Island, St. Simons Island, Sea Island, and boat access to Little St. Simons Island.